There are three more restaurants from my holiday trip to Hong Kong that I want to cover here before too much time passes! The first of these: Yung Kee. As a kid, at least one Sunday a month, our family used to go to Yung Kee for lunch after church - just a short walk down the hill, and on the way to the MTR (HK's subway system) and taxi stands in Central, Hong Kong's financial district. 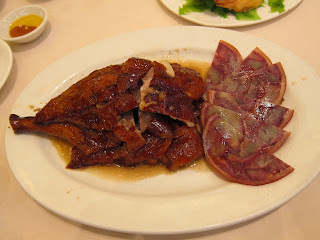 I remembered my parents telling us every visit that Yung Kee was famous for its roasted goose, and it never disappointed us - my brother and I looked forward to it every week, as though it were the true reward for each trying to be as good a person as we can be, including sitting still during church service (was the afterlife that important when you can have roast goose in this one?!). The family-owned restaurant has been a staple of Hong Kong since its founder opened his first small food stall in 1942, is steeped in the city's history, and one of the few that has truly stood the test of time - recently becoming a one Michelin Star restaurant (2010). 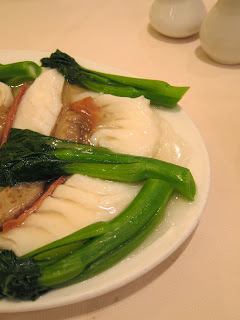 Though the awarding of Michelin stars in Hong Kong has been the subject of controversy (locals feel inspectors do not have enough knowledge of Chinese cuisine to appreciate local venues - and purported the awards resulted from a superficial survey of western friendly restaurants, mainly conveniently found in five star hotels). Wholesale controversy aside, Yung Kee is one of the restaurants that are respected by locals and in my opinion deserving of the star. On this visit, we opted for dinner. 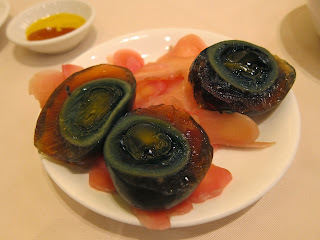 Meals at Yung Kee always begin with an amuse bouche of Thousand Year Old Eggs (pidan) with sliced Pickled Ginger. Those unfamiliar with this Cantonese staple may be a bit appalled by its appearance - the eggs are brown / black and the preserved yolk basically looks like it's long past being safe for human consumption. In fact, it looks like even bacteria might keel over at first bite of these things. But I grew up with this so I love it. Nowadays you would mainly find these eggs chopped up in congee (rice porridge) with lean pork (pidan shao yuk juk) - but Yung Kee lets their pure taste /texture shine on their own halved, with sliced pickled ginger - and I find their offering the - um - the freshest tasting ones I've ever had, with an incredibly creamy, unique tasting savory center with just a hint of sweet, encased by a light, lovely gelatinous outer layer that falls away with each bite. The sweet / sour/ spiciness of the fresh, crunchy pickled ginger slices cut through the denser flavors and textures of the egg nicely. 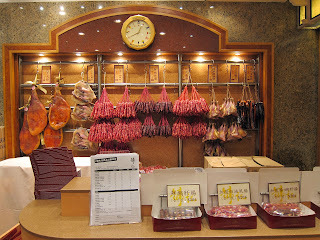 Other preserved goods Yung Kee has for sale: chinese 'waxed' sausages (lap cheong) and Preserved Fresh Goose Liver Sausages. That Yung Kee is focused on service and keeping up with the times is evident in its menu. Its answer to the questions most people ask of any new restaurant they go to - "What are your signature / best dishes? What would you recommend?" - is to create prix fixe menus around their award winning dishes - calling awards out right on the menu - and to do it in four languages - the better to service all the tourists who have found their way to the place. Some of the awards were from quite a while back, but the quality of some of the dishes have been lovingly maintained with pride. At our very knowledgeable server's (been with the restaurant 10+ years!) recommendation, we went with the prix fixe for two people, even though there were three of us - since the dishes included some of our favorites, and the portions were large enough to feed us all. First dish, of course, was the Roasted Goose with Preserved Trotter with Soy Sauce (Best of the Best Culinary Award 2002). This is hands down heaven on a plate - the most succulent, flavorful roast goose I have ever had, with the perfect fat to meat ratio and incredibly juicy yet crisp skin. The preserved trotters had a subtle salinity and crunch that served as worthy companion to the goose. According to my parents, the secret to the unbelievable deliciousness of Yung Kee's roasted goose is that they roast them on the premises daily. I would gladly sentence myself to calorie purgatory for all eternity if I could just have this roast goose forever. 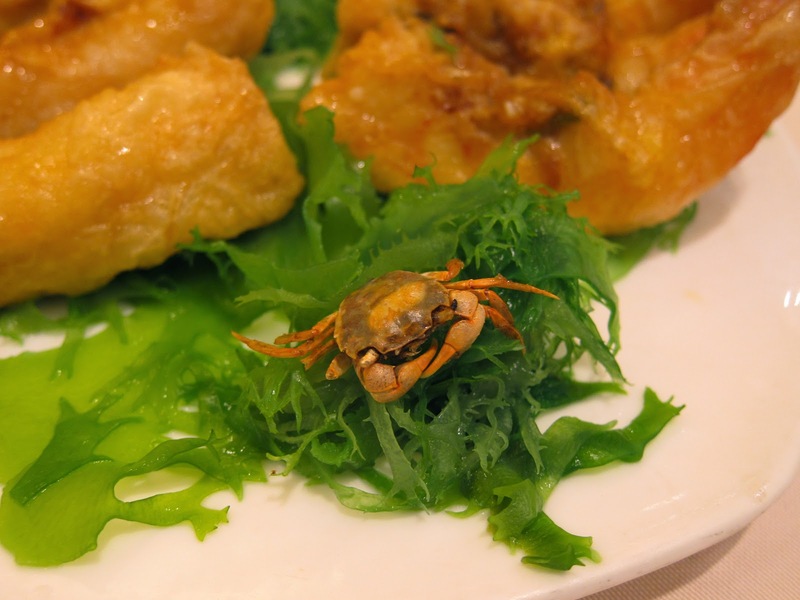 Next up was the Deep Fried Prawn with Mini Crab Roe (Best of the Best Culinary Awards 2001). Our favorite thing about this dish was the little baby crab they included as garnish (to indicate the presence of crab roe) - an adorable detail that we ended up having a lot of fun with via discussions of how to get the fragile little guy home without crushing him (he ended up travelling in 10 layers of tissue that then went into my dad's shirt pocket), and Amelie/gnome inspired photos. The fried prawns themselves were unremarkable in taste and texture, unfortunately - and even a little soggy. Our next course was Abalone with Mushroom in Superior Broth - this one we ended up ordering a third serving as they come in individual portions and it's hard to split an abalone in soup! 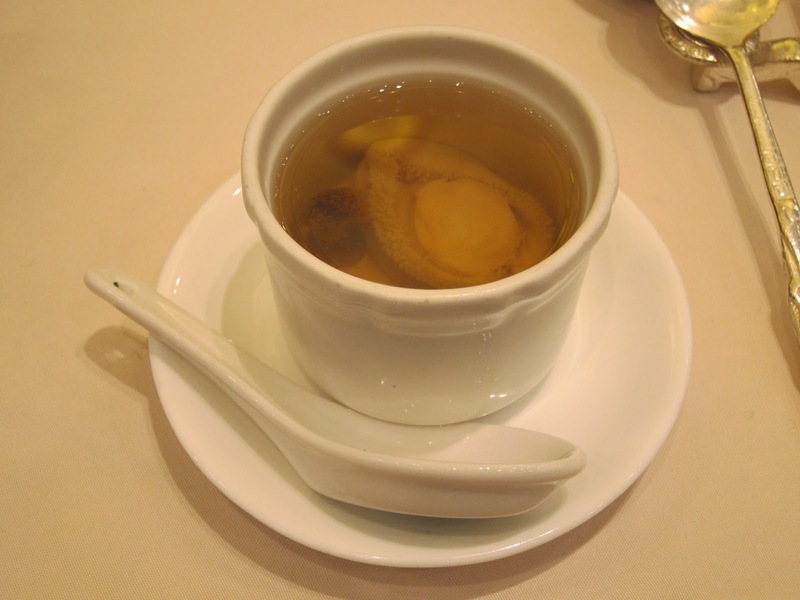 This broth was amazing - its clear, clean taste really hits you to your core at first sip. The abalone was perfect, just the right (bite) size - and cooked to the perfect degree so that it's very soft and easy to chew, but still retains its structure so that you get substantial bites for a soup that's nourishing but not overwhelmingly rich. For our second entree, we had the Steamed Garoupa with Chinese Ham, plated with kai lan for contrasting crunch and pops of green. The saltiness of the cured ham helped enhance the subtle flavors of the fish. We enjoyed this dish, but it was not mind-blowing. Our last savory course was Wonton Noodles - this is somewhat unusual as people typically eat wonton noodles as a single-bowl meal, not as part of a multi-course dinner. 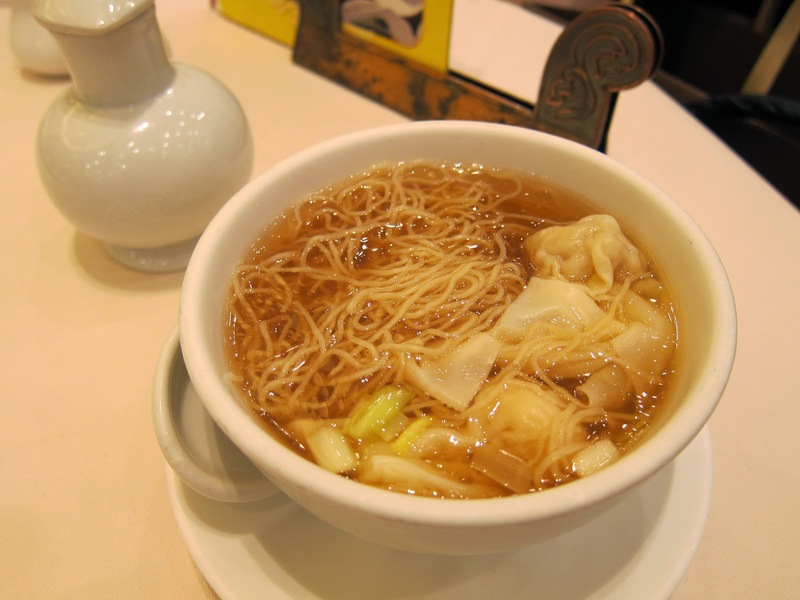 With formal Chinese dinners - especially with banquets - it is customary to serve rice and/or noodles at the finish, but usually in the form of fried rice and/or stir-fried e-fu noodles, not wonton. In discussing this dish, I learned Yung Kee's original rise to fame was with their wonton noodles. The family was poor and started out with a simple food stall serving wonton noodles. 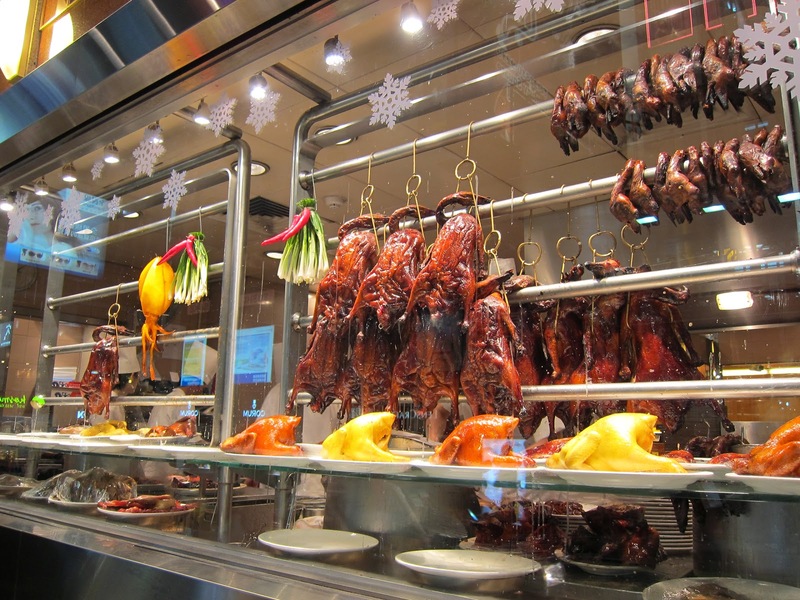 Word of mouth spread quickly and people came far and wide to taste them - and it is with the money the family made from their wonton noodles that they then built their signature roast goose business. It's easy to see how they could become famous for this simple dish - sometimes it is the simple ones that require most skill: you can't hide behind fancy ingredients and complex visual presentations. Yung Kee wins with fresh, amazing, clean, perfectly sized shrimp wontons clearly made with fresh wrappers, fresh noodles made needle thin to let the wontons shine, but substantial enough to sop up the clear flavorful broth, served at just the right temperature - just hot enough to seize your soul, but not scorching so as to burn you going down. (You can always tell when wrappers are mass produced or pre-made days ahead - they are usually more dense, stiff where they are 'sealed' with egg, and some even rubbery in texture. Yung Kee's wrappers are almost rice paper thin, yet hold together even in the hot broth, and are flowing / light.) Though there has been sadly reported infighting within the family in recent years with the heirs debating whether to sell the business off, on my particular visit at least, it did not impact the quality of the food - and the traditions, care and pride in their 'founding' dish seems to have still come through. The Wonton Noodles was my second favorite dish of the meal (tied with the Abalone soup), after the roast goose. 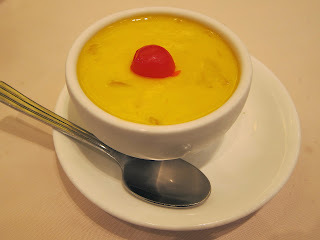 For a sweet finish, the meal ends with Mango Pudding, which has a consistency between custard and jello. This has become a standard dessert course at Chinese restaurants. Yung Kee's stands out again with simple, quality ingredients and preparation - the pudding is smooth, with large chunks of fresh mango inside. All in all, our six-course meal came out to HK$860 + 10% service charge = HK$946 total or about US$121 for 3 people!!! I may not go to church very much (at all?) anymore, but I am still very much in love with Yung Kee and see it as a treat / reward. Definitely going back first chance I get next time I'm in Hong Kong. And keeping my fingers and toes crossed that one day they will look to create an outpost in LA or San Francisco - I would attend their services religiously for sure!! !